We’re proud to call Palmerston North our home. The beautiful Manawatu River bridle path and famed Rose Gardens are within walking distance, offering fantastic views across the mountains to the south and east. From the connoisseur’s choice of cafes on George Street to the Plaza for fashion, you’ll be spoiled for choice. The Lido Aquatic Centre in Palmerston North is an Award Winning aquatic facility in New Zealand. Only a few minutes drive from our motel. They offer a wide range of services for both families and fitness advocates such as the popular Hydro slides, indoor/outdoor swimming pools, spa pools and sauna facilities. At the heart of the Manawatu, Palmerston North (or Rose City) offers some of the finest dining, shopping, and recreation in the lower north island. Clean air. Open spaces. Air, road and transport links to the south and north, including recently announced services direct to Nelson. Palmerston North really does have it all. 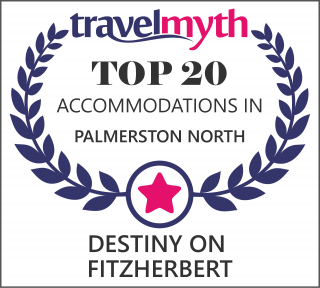 Palmerston North is the proud home of the Manawatu Turbos, numerous All Blacks, a nationally renowned training facility at Massey University, and last but not least the New Zealand Rugby Museum. Pay a visit to learn a little more about just how important the national sport is to us here in the Manawatu.